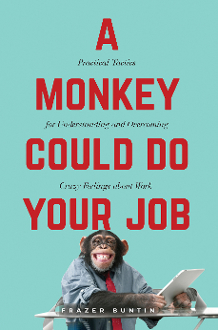 Do you ever feel like your job is so tedious a monkey could do it? Or maybe you feel like you’re in way over your head, or better yet, like you have no idea what you want to do. Whether you’re just starting out or you’re a senior-level executive, navigating your career can be a daunting task. From hunting down opportunities and scoring interviews, to wrangling emails and managing a dysfunctional team, it’s easy to feel overwhelmed by it all—not to mention getting your actual work done! In thirteen simple chapters, Frazer Buntin cuts to the core of these common feelings. Using hysterical, relatable anecdotes from his rapid rise to CEO, Buntin strives to empower a modern-day workforce to gain autonomy in their careers. His practical advice will keep you sane and striving for success as he outlines tactics you can employ at early, middle, and advanced stages of your career. Each chapter addresses a common feeling or question you may have during any one of these stages. Flip to the table of contents and see how many resonate with you! “A refreshing, humorous, and down-to-earth wake-up call to anyone wishing the fairy-tale perfect job will simply appear for them.” —Kevin Eyres, Former Managing Director, LinkedIn Europe. “As a business owner, I recommend this book as a great resource for practical advice for anyone trying to navigate their career.” —Laura Crookston, Founder and Creative Director, Circa Design. “There were sections of this book where I thought the author was taking thoughts straight from my brain. It was strange to have the feelings and concepts be that accurate.” —Bailey Brandon, Manager, Guerilla Gravity Bikes. “A fantastic read whether you are in your first job or are a seasoned executive . . . eminently readable and approachable, making the insights and lessons easy to absorb.” —David Corts, Chief Operating Officer, StudioNow. “The final chapter is incredible. I finished the book feeling incredibly uplifted.” —Josh Martin, Vice President, USI Insurance Services.